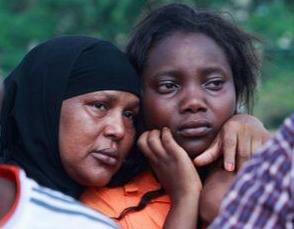 Garissa attack leaves a hundred and fifty dead. Friday April 3, 2015 - The death toll rises after Al-Shaabab attack on Kenyan university. At least a hundred and fifty reported murdered during Thursday's attack on Garissa University College. The UK and US condemn attack and offer support to Kenya. Tonight's Daily Nation newspaper reports that the bodies of forty eight students killed in the attack have been brought to Chromo Mortuary in a Kenya Air Force plane from where the task of identifying the victims would begin. Health Cabinet Secretary James Macharia said the government has set up a National Disaster Operations Centre to assist families and friends of victims with information on the status of their loved ones. “The families can get the list of victims who passed away (read were killed) during the attack and where their kin can receive the body. Also, there is a manifest of students who survived the attack, where they are at the moment and how they can be linked to their families,” said Mr Macharia. At Nyayo stadium, he said, there will be information and assistance for processing transfer of bodies from Chiromo Mortuary, receiving and transfer of survivors. The crisis operations centre is being run by officials from various ministries, and it is also offering psychosocial support and counselling services. He said the 500 students who survived would be ferried to Nairobi using National Youth Service buses. Further, the CS said since facilities at Garissa Level Five Hospital have been stretched, the ministry had dispatched a truck with medical supplies. “We have also sent a total of six medical staff, two surgeons and four doctors and nurses, to help,” Mr Macharia told journalists at Wilson Airport. He said the government would pay the medical bills of all victims. “No one will be required to pay anything for whatever services provided,” he said. The BBC reports that even as Kenya mourns the tragic loss, questions are being asked about the preparedness of the security forces given that rumours had been circulating about a planned Al-Shaabab attack. "Kenyan newspapers say there was intelligence information of an imminent attack on a school or university. Locals question why security was not heightened, with only two guards on duty at the time of the attack. Four more people have been found alive on the campus, but two are suspects and have been arrested, sources say. One is said to be a Tanzanian national with no known links to the university. Kenya's interior minister declared the recovery operation over. Joseph Nkaiserry identified the victims as 142 students, three police officers and three soldiers. "We have called off the operation after combing the whole university, all the bodies have been removed from the scene and brought to Nairobi," he said after arriving back in the capital. Police in neighbouring Uganda say they have received information suggesting a similar attack is being planned there. A dusk to dawn curfew has now been imposed in Garissa and three nearby counties. The BBC's Anne Soy saw ambulances leaving the Garissa campus on Friday and hundreds of survivors being sent home. One survivor, who hid in bushes for five hours, told the BBC that students had raised the issue at the end of last year, but only two armed guards had been provided. One of the few students from the local community, he said he would never set foot on the campus again. The heavily armed gunmen killed the two security guards first, then fired indiscriminately at students, many of whom were still asleep in their dormitories. They singled out Christians and shot them, witnesses said. The Kenyan government has offered a reward of $53,000 (£36,000) for the man it says planned the killing - Mohamed Kuno, a former Kenyan schoolteacher, now thought to be in Somalia. The US news outlet CNN reports that an apparently shaken President Kenyatta has appealed to all Kenyans to remain calm in country where residents still remember the Westgate Mall attack that left at least sixty dead. He says his government will now speed up the recruitment of more police personnel. "The ministry posted a "Most Wanted" notice for a man in connection with the attack. The notice offers a reward of 20 million Kenyan shillings, which is about $215,000. 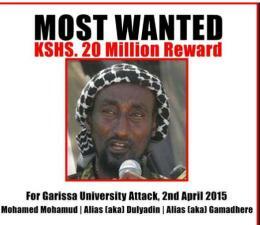 The name listed is Mohamed Mohamud, who also goes by the aliases Dulyadin and Gamadhere. "We appeal to anyone with any info on #Gamadhere to share with relevant authorities and security agencies," the Interior Ministry posted on Twitter." "Visiting the scene of the carnage, Kenya's Interior Minister Joseph Nkaissery vowed that the country would "not bow to terrorist threats". "I am confident we shall win this war against our enemies." 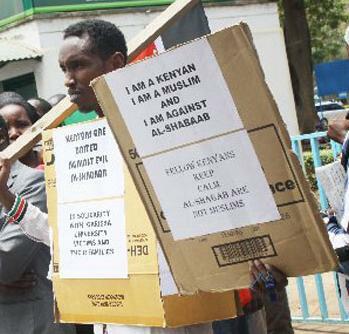 Al-Shabab also carried out the Westgate shopping mall massacre in Nairobi in September 2013 when four gunmen killed 67 people in a four-day siege. During Thursday's attack, al-Shahab's spokesman Sheikh Ali Mohamud Rage said the killings were in revenge for the presence of Kenyan troops in Somalia as part of the African Union's force backed the country's internationally-backed government." Meanwhile the UK Minister for Africa James Duddridge has condemned the attack and has pledged continued UK support in the fight against Al Shabaab. Mr Duddridge said: I strongly condemn the attack that took place this morning in Garissa, Kenya. I offer my condolences to the families and loved ones of those who died. There can be no place for such senseless acts of violence in our societies. The UK will continue to stand by and support the Kenyan government in its fight against terrorism, and in its efforts to bring to justice those responsible for this barbaric act." "The United States condemns in the strongest terms today’s terrorist attack against the innocent men and women of Garissa University College in eastern Kenya. We extend our deep condolences to the families and loved ones of all those killed in this heinous attack, which reportedly included the targeting of Christian students. Our thoughts and prayers also are with the many injured. The United States is providing assistance to the Kenyan Government, and we will continue to partner with them as well as with others in the region to take on the terrorist group al-Shabaab. The United States stands with the people of Kenya, who will not be intimidated by such cowardly attacks."